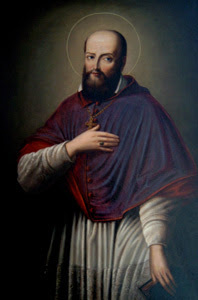 Saint Francis de Sales (1567-1622) was Bishop of Geneva and is a Doctor of the Church. St. Francis taught that we can all attain a devout and spiritual life, whatever our position in society: holiness is not reserved for monks and hermits alone. His wrote that “religious devotion does not destroy: it perfects”, and his spiritual counsel is dedicated to making people more holy by making them more themselves. In his preaching against Calvinism he was driven by love rather than a desire to win: so much so, that it was a Calvinist minister who said “if we honoured anyone as a saint, I know of no-one since the days of the Apostles more worthy of it than this man”. St. Francis is the patron saint of writers and journalists, who would do well to imitate his love and his moderation: as he said, “whoever wants to preach effectively must preach with love”. He was beatified in 1661, canonized in 1665, and proclaimed Doctor of the Universal Church in 1877. His feast is celebrated on the 29th in the Tridentine calendar, and on the 24th in the modern calendar. On Sunday, January 28th, at 10:00 a.m. the Institute of Christ the King Sovereign Priest in Saint Louis, Missouri, will celebrate the External Solemnity of Saint Francis de Sales, followed by a conference and dinner. The very Rev. Msgr. R. Michael Schmitz, Vicar General and Provincial Superior of the Institute will be the homilist and lecturer. Dinner tickets are $10 for adults, $5 for adolescents 12—17, and children are free.